My sister sent me an invitation to join her network on LinkedIn, the networking site for professionals. I did join her network, but decided it's time for me to get on board as well. You may have seen the term "community radio" bantered about recently, so I thought I'd give my take on this term, but, more importantly, share my thoughts about how this term can apply to Big D Country. In earlier years, and during some of my years in terrestrial radio, stations were active participants in local events, whether it be a parade, a remote from Celebrate America at Tom Brown Park, or participation in a ministry's effort to help hungry people in our area. What's more, these things had to be documented as the FCC looked closely at stations being operated in the public interest. Today, while the FCC may look at public files and impose fines for missing or inadequate files, let's be real. What purpose does that really serve? Outside of government coffers, there really isn't a purpose, unless it is maybe to frighten other licensees into compliance. To me, community radio is a station that helps provide the city/community's listeners with news of importance to them - be it traffic, weather, or a school play next week. And, it is important to become more visible when we are out and about. Internet radio is not an easy sell. For starters, with terrestrial radio, it is possible for someone to tune across the dial and "find" your station. That is less likely on the Internet. One of my goals is to help Big D Country become one of the best "local Internet radio stations" on the web. It's still Internet radio, but it is targeted to superserve a certain region - in our case, that includes Tallahassee, North Florida, and South Georgia. To increase the station's "reach" I have been working at getting our content across multiple platforms. We are on Live365, Radio Terra, and RadioTime as of today, with several applications still pending. We also are offering station T-shirts, tote bags, calendars and other "bling" as part of the effort to improve our visibility throughout the community. Right now, you can expect a minimum of four information updates during the mornings, with a look at traffic, road closures, weather, and the like. In addition, we'll tell you about community events as best we can. On our Facebook page, you'll find links to community resources, including event calendars, the Tallahassee/Leon County Civic Center, and other local websites containing interest to those living in the area. On a few web sites I visited while searching for platforms, I noted that a few still did not list Internet-only stations, with one saying, "because for the most part these are computers running unmanned, unattended, looped playlists." Ouch! I do want Big D Country to be more than a playlist that occasionally gets updated. 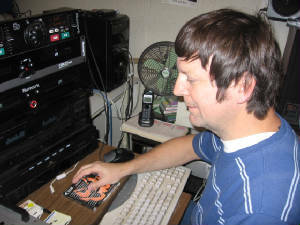 Right now, as a one-person shop, I'm hosting live programming five to six days a week; obtaining new music from the record companies and artists constantly; keeping Facebook and Twitter updated; and seeking out sponsors and advertisers for our ultimate upgrade back to PRO on the stream, allowing us to hopefully once again be on iTunes. Delta Star Radio, the organization behind Big D Country, has recently invested in a building, new equipment, and the new domain and website, as well as the design for our new logo. I welcome the opportunity to work with area businesses, churches and ministries, nonprofits, and others as Big D Country works to become an active member of the Tallahassee community. In the grand plan I have of streamlining operations and trying to make things easier to locate and keep track of, I am adding a blog to the Big D Country website. It only makes sense, as a lot of my blog posts were related to radio, and, in particular, this radio station. I first began blogging back in early 2006 on blogspot, later moving over to the blog feature on MySpace. Over the last year it seems like any personal interaction on MySpace became more of a musicians vote-fest. I'm not sure anyone was even reading the blog there. It only seems like a natural fit that the blog should end up on my own website. And, I would love to have some interaction. If you have questions, whether they are related to Big D Country, country music, or radio in general, I would be happy to answer them. I'll also post some blogs to let you see what goes on behind the scenes of creating a radio station. In my next post, I'd like to share some thoughts about "community radio." That's a rather vague term, in actuality, and one of the catch-phrases bantered about that means different things to different people. I will share my take on it, and the ways I hope Big D Country will, in one sense, become a community station.